As you walk through the Becontree Estate, it seems pretty boring. It’s not beautiful, it’s not ugly. At best, it’s pleasant; at worst, humdrum. It seems stolid and worthy, not visionary. But take another look. The scale of its ambition was breath-taking and it was, in its understated British way, revolutionary. But Becontree was planned and built in England where the most revolutionary social changes can take place, and people in general do not realise that they have occurred. 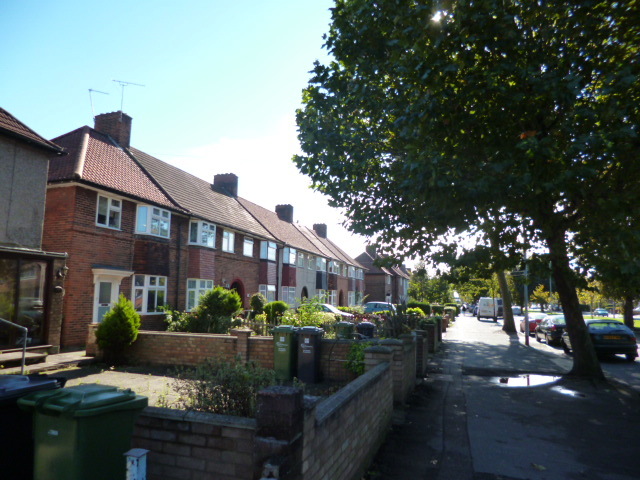 The Becontree Estate was conceived in the brief post-Great War coupling of hope and fear. Homes fit for heroes and the concern those very heroes might succumb to Bolshevism in 1919 persuaded the Government to approve a London County Council scheme to build 29,000 new homes for some 145,000 London residents. 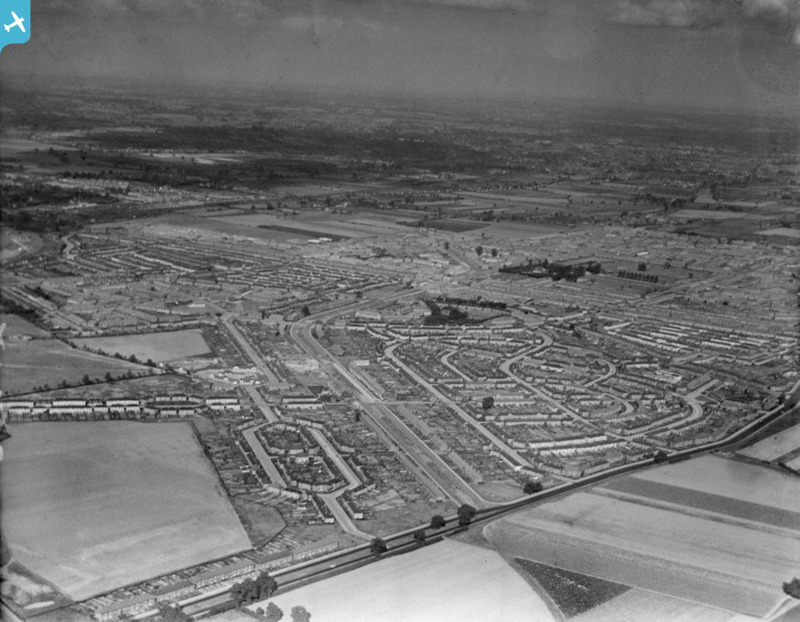 Of those, 24,000 houses were to be built on 3,000 acres of market gardens, cottages and country lanes beyond London’s eastern borders in Essex. This, by the way, was a local authority controlled by Tories (in the guise of the London Municipal Reform party). The belief that working people should be decently housed and that the responsibility for this lay – for better or worse, depending on one’s politics – primarily with the state ran deep at this time. The original scheme included churches, shops, no less than 25 schools and a new civic centre. The planners recognised that the flat site lacked, in their words, ‘attractive natural features’ but believed 600 acres of open space and parkland and a carefully-designed and tree-lined streetscape would create a pleasing environment. Shiny drawing-board visions are rarely fully realised and Government spending cuts slowed and curtailed this one but the planned target of homes was met in 1934. 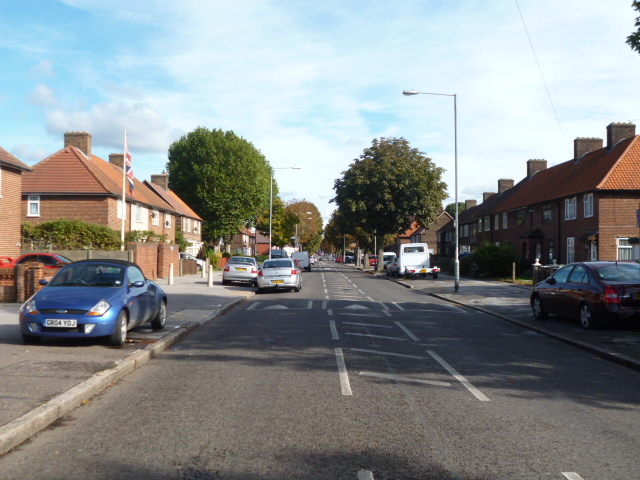 Becontree was proclaimed – and remains by most measures – the world’s largest council estate. As far as my Mum was concerned, it was heaven with the gates off. And if that’s a little anecdotal and tinged with nostalgia, a survey in 1947 found 85 per cent of tenants liked their houses and 63 per cent liked the neighbourhood. 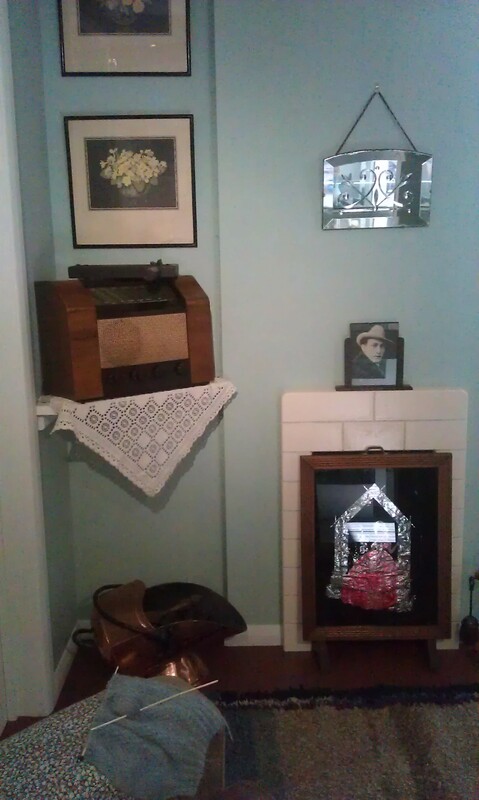 Simple amenities – ‘cupboards, the stove and everything’ – could make a council house seem like ‘a palace’ (3). 8. The tenant shall clean the windows of the premises at least once every week. 16. The tenant shall be responsible for the orderly conduct of his children on any part of the Estate, for any nuisance or annoyance they may cause to other tenants or to members of the public; for any damage to or defacement of any building, wall, fence, gate, or any other property of the Council, and shall replay to the Council the cost of making goods any such damage or defacement. 19. The tenancy may be determined [terminated] by the Council at any time by seven days’ notice in writing. On breach by the tenant of any of these conditions the tenancy may be summarily determined by the Council at any time. And we shouldn’t sugar-coat the paternalism here. There was a clear intention to encourage respectable living – pubs were restricted and the virtuous domesticity of gardening heavily promoted. But, remember, this was not, on the whole, a respectability which sat uneasily with the aspirations and characteristics of the vast majority of Becontree’s new inhabitants. Those inhabitants were not generally, in Young’s awkward phrasing, ‘slum people’. In 1934, 95 per cent of the adult male population were ‘employees’; 80 per cent were manual workers – a large majority working in manufacturing or transport and communications, a majority defined as ‘skilled’. You needed to be both respectable and – in working-class terms – relatively affluent to live on the Estate. The other striking feature of the Estate – particularly in its early days – was the preponderance of young married couples with school-age children. Half the population was under 18 at the time of Young’s social survey and the average age just 23. There was thus an undeniable social homogeneity. This has frequently been contrasted with a sentimentalised vision of the bustle and colour of an old East End left behind and was compounded, for critics, by the architectural uniformity of the Estate – the dead hand of municipalism as it is often perceived. 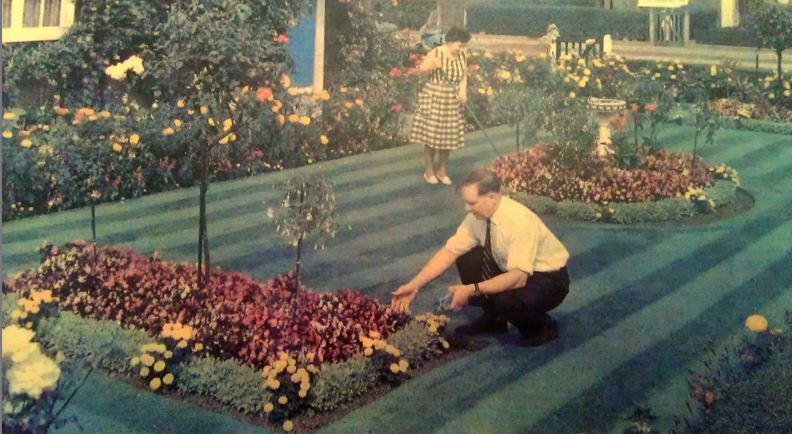 There’s no doubt also that there was a bleakness to the Estate in its early days. ‘The first tenants were pioneers, colonists in an area which had no urban facilities’ (Young again) and shops, schools and community facilities of all sorts were in short supply. The civic centre was never built and the Estate was horribly divided between three local district councils before the Municipal Borough of Dagenham was formed in 1938. I went for a walk and when I came back, all the houses looked alike. I was in a terrible state – in tears. The workmen said ‘What’s the matter, ducks?’ I said, ‘I can’t find my house’. In the end, she found her house as hundreds of thousands of others have found a house – and a home – in the Becontree Estate. Nowadays, its appearance is much altered – in good ways and bad. Right to buy and owner occupation have long since eroded the besetting homogeneity of the Estate. Cars are everywhere, often in those previously lovingly tended front gardens. And the trees have grown. Much of the estate looks as suburban now as it does municipal (not a bad thing) and it all – to this observer – looks pleasant and cared-for. Its early planners might have settled for that and perhaps we should too. 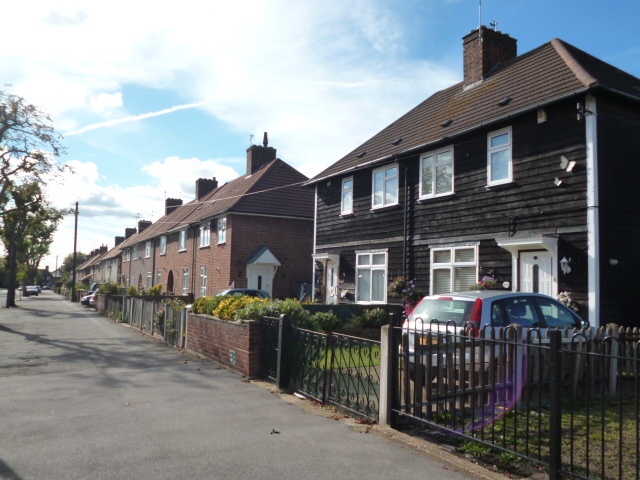 (2) In Family and Kinship in East London (1957), Michael Young and Peter Wilmott painted a bleak picture of life in the postwar Debden estate. 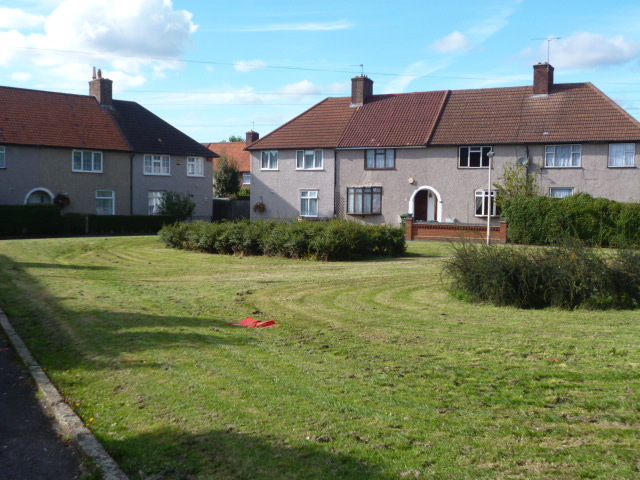 Lyndsey Hanley’s Estates (2007) excoriates the Chelmsley Wood estate of her childhood. See also: Becontree Estate saw East End ‘reborn’, Barking and Dagenham Post, 9 November 2011 and the Valence House Museum; London Borough of Barking and Dagenham, Local Studies Information Sheet, No. 16. Do visit the Valence House Museum – in the heart of the estate – for an excellent social history of the area. Thanks very much for the comment – I’m glad you think I got it right. I’ll look forward to seeing the film (and just gave it a tweet). Pingback: Here be dragons: Баркинг и Дагенхам (часть 1) | Russian GAP. Pingback: Here be dragons: Баркинг и Дагенхам (часть 2) | Russian GAP. 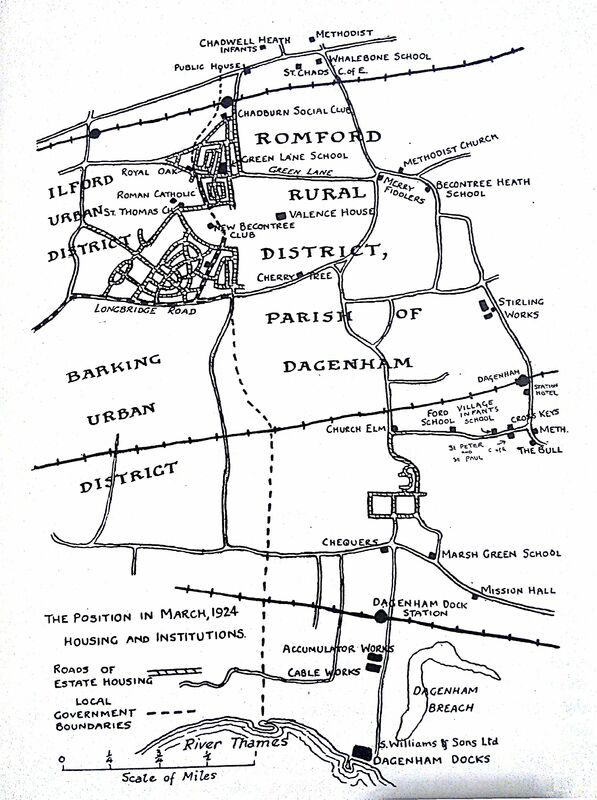 Concerning the reference to pubs being restricted when planning the Becontree Estate, B&D Council once produced a booklet on Dagenham’s pubs. It described that rather than having numerous small pubs as in for example Stepney, much larger pubs were planned. Not to restrict availability of alcohol, but for policing purposes. The reason being that in the event of disorder, fewer, larger pubs were deemed easier to police, compared to potentially having to attend to many smaller ones. The logic being to concentrate the pub related problems in fewer locations. A number of these pubs have now been demolished – The Robin Hood, The Bull Tavern for example. Thanks for that interesting comment and reference. I guess that booklet is in the archives somewhere. It reminds me of the whole trend towards ‘improved’ roadhouse pubs in the interwar period which were intended to promote more respectable drinking in a family atmosphere. The Downham Tavern on the Downham Estate is a good example.